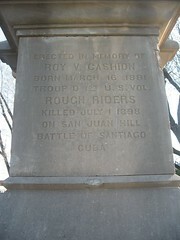 After his regiment helped in the victory at Las Quasiman, Cuba. 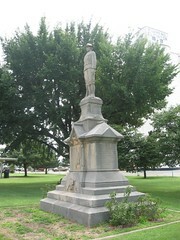 he was killed as he charged over San Juan Hill. 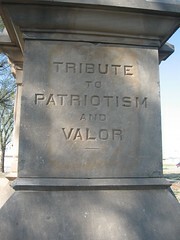 July 1, 1898 in the Spanish-American War. 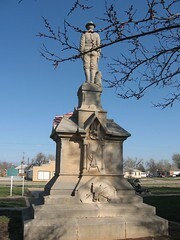 This Oklahoma boy - Hennessey High School graduate - rode horse-back to Gurhrie, and enlisted on May 5, 1898, in "Rough Riders" under Col. Theodore Roosevelt. 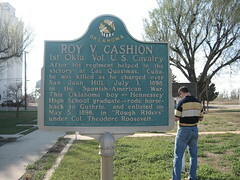 The Roy Cashion Memorial statue is located in Memorial Park on the west side of Highway 81 in Hennessey, Oklahoma. 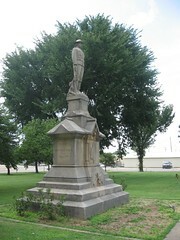 It may be the first outdoor statue erected in Oklahoma and was paid for with funds collected from school children, town appropriations, and a warrant drawn on the territorial treasury. Perry A., Ira J., Byers, Carl O., Arthur W., Jesse H.